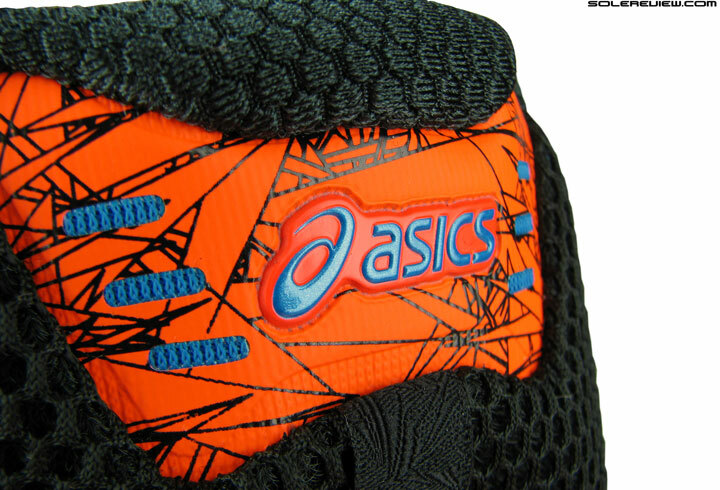 Asics's marketing pitch: An extreme amount of the most intense shock absorption around. 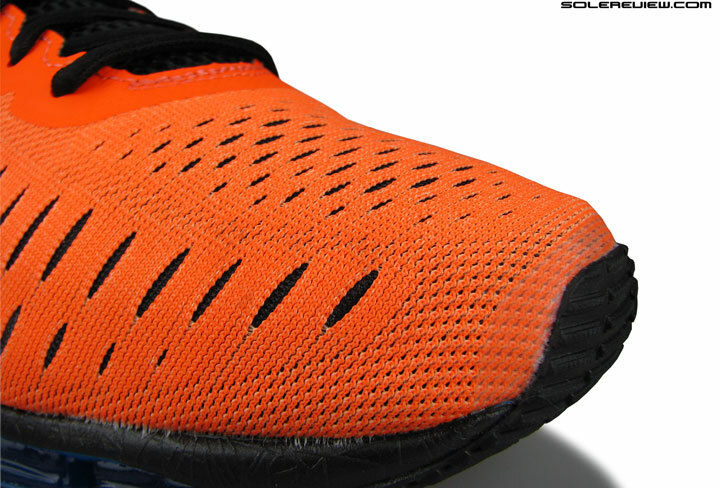 Upper: Engineered mesh with lining, plastic heel counter. 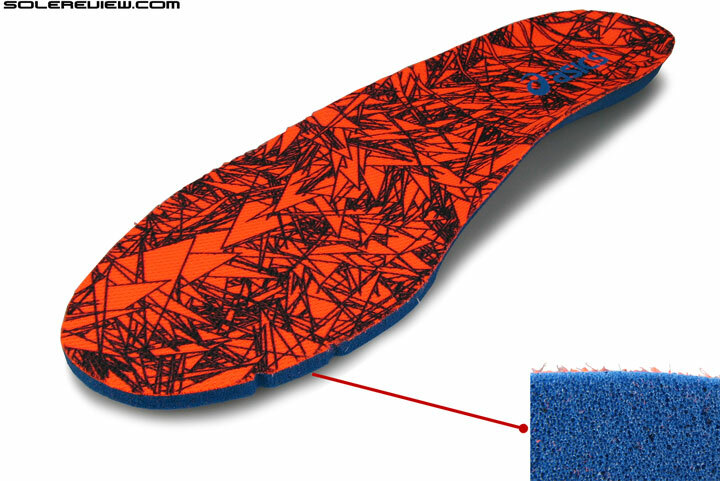 Midsole: Compression molded EVA foam (85% of volume), with Gel units (15%) wrapping the foam. 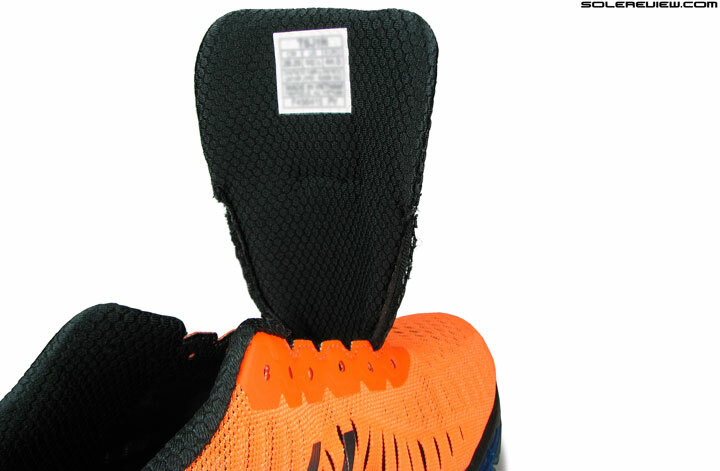 The midsole has a full length plastic plate underneath. 10 mm heel to toe offset. 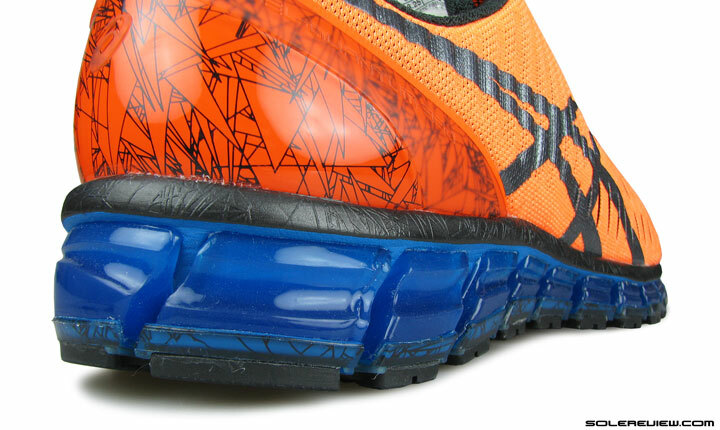 As far as cushioning goes, the Quantum 360's Gel units are more show than substance. The soft cushioning comes from the foam midsole, and the combination of the Gel and plastic midsole plate makes the ride supportive and half-responsive. The upper runs narrow, and the toe-box is shallow. Soft yet supportive ride, better transition than the Nimbus, smooth upper interior, responsive rearfoot cushioning. Midfoot transition feels laggy, forefoot cushioning feels inconsistent, no optional widths, zero reflectivity, very heavy, expensive, no inner sleeve. The unique looking Asics Quantum 360. What does it do? We’ll tell ya. There are a few things you should know right away about the Asics Quantum 360. One, it has a better ride and transition experience than the Nimbus 17, which turned out to be super mushy. Two, like most Asics, the soft cushioning feel comes from the use of foam – and not so much the effect of the Gel pads surrounding it. While the official Asics press release has never claimed that the entire midsole was made of Asics Gel, the general impression going around is quite the opposite. Most users think that they’re running on a midsole made completely of the jelly like material. In reality, the humble EVA foam happens to be the reason behind the soft ride. There is plenty of Gel, but you’ll never guess what happens next. Three, the 360 degree Gel ring’s functional result is somewhat unexpected. The Gel placement when combined with the heel-to-toe TPU plate, acts as a support structure, and not the agent of cushioning one would assume it to be. 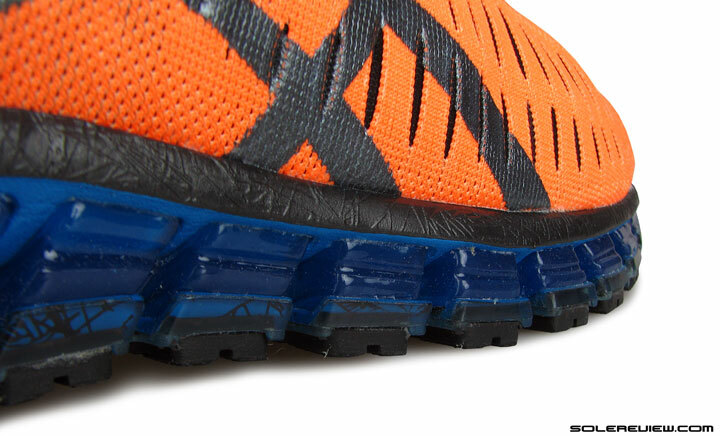 Sure, the Gel pods have a marginal cushioning influence, but there’s a huge gap between what you see and what you get. Four, the upper fits narrow, and the toe-box is pointy and shallow when compared to Asics staples such as the Nimbus/Kayano/Cumulus. That was the short version of the review, and all you need to know about the Quantum 360. What follows next is a closer look at the inner workings of the design – cause and effect, if you will. Gel is Asics’s marketable cushioning tech, the same way how Boost is for adidas, air is for Nike, and Everun is for Saucony. Long before it started showing up in visible ‘jelly’ form, Asics Gel units used to be embedded inside the midsole, hidden from plain sight. There was a time when sealed urethane bags used to be filled with actual Gel and then placed inside the midsole, like how it was on the 1990 Asics GT-Xpress. Here’s a picture in the vintage advertisement below. 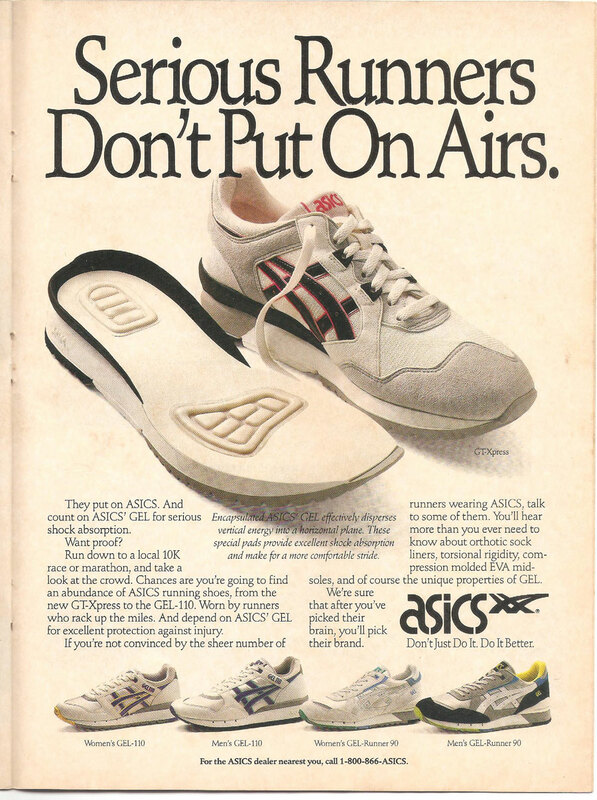 A vintage 1990 advertisement plugging Asics’s gel based cushioning tech. 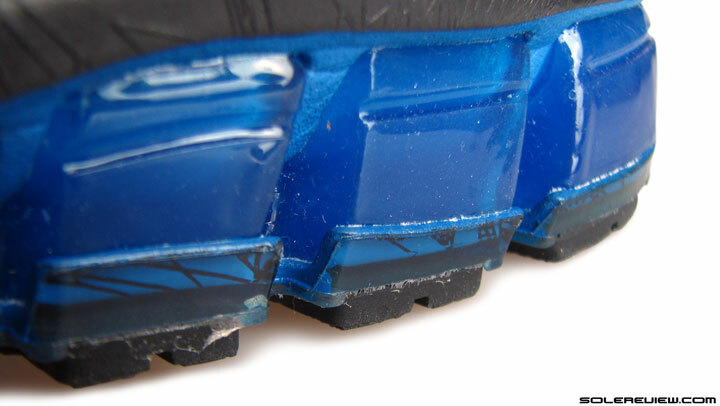 Over time, most of the Gel moved outside the midsole, with only a small dime-like piece staying behind inside. We saw this in our dissection of the Nimbus 15; the rearfoot edge provides a blend of Gel and foam during foot-strike, while the heel center is mostly foam. The forefoot Gel windows are merely cosmetic, and the small circular piece inside the midsole barely makes a dent in the cushioning outcome. Asics and Mizuno are conservative running shoe brands, and not prone to changing design directions as rapidly as adidas, New Balance or Nike. For its business size, even Saucony is brave for quickly bringing new ideas to the market, successful or not. Asics and Mizuno – they take a long, long time to change. Such is the way in the land of the rising sun. Lately, Asics is trying to shake that inertia off with a slew of new launches. Recently, the uber-expensive Metarun was an example of introducing new tech (but within the boundaries of Asics’s conservative design template), and earlier this year, the Fuze-X was released with mainstream aspirations. Asics’s Gel Quantum 360 made its way into the market in Fall last year, with an army of Gel pads surrounding the midsole. The ‘full cushioning tech’ approach has been a part of the shoe industry playbook for years; look no further than examples such as the adidas Megabounce, Nike Air Max, and the Mizuno Wave Prophecy. These shoes and their price tags do not necessarily make them better running shoes, but as long as the objective is to grab attention on a double page spread, they get the job done. The Quantum 360 is to Asics what the Air Max 2015 is to Nike. Sorta, because the midsole isn’t 100% Gel. The Q-360 is of the same mold, except that it doesn’t go 100% with its midsole material like how the Nike Air Max does it. 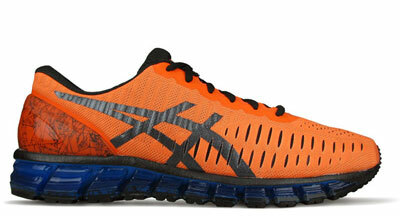 It is Asics’s somewhat restrained stab at showcasing their cushioning tech without the relative constraints of costs. According to their press release, the Quantum 360 is a response to consumer feedback of wanting more of the Gel experience. Does all the Gel veneer – which makes the Q-360 lead-weight at nearly 400 gms/14 Oz – actually translate into an unique running shoe ride? One can view this from a couple of angles. If you expect the 360 to ride differently than other long-continuing models you’re used to, then the answer is a resounding yes. The Quantum’s new spin on midsole design does set it apart from the rest. 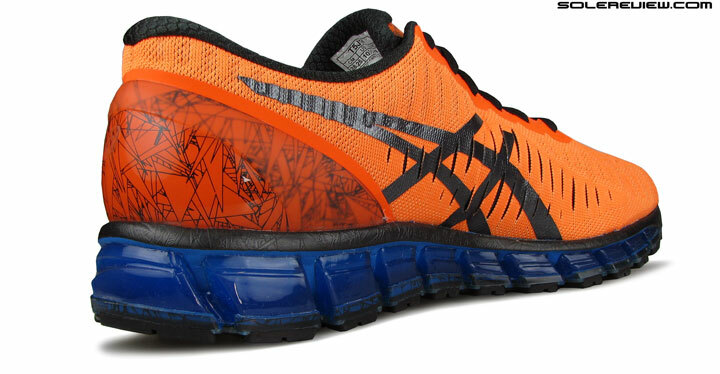 Like we said, we find certain parts of the Quantum’s ride quality better than most of other Asics models we’ve reviewed. On the other hand, if you were expecting the Q-360 to deliver an undiluted Gel cushioning experience underfoot, then you will be disappointed. For the Quantum, like others in the Asics assortment, relies on good ol’ foam to produce cushioning softness. 22 Gel pillars wrap around the soft foam midsole. 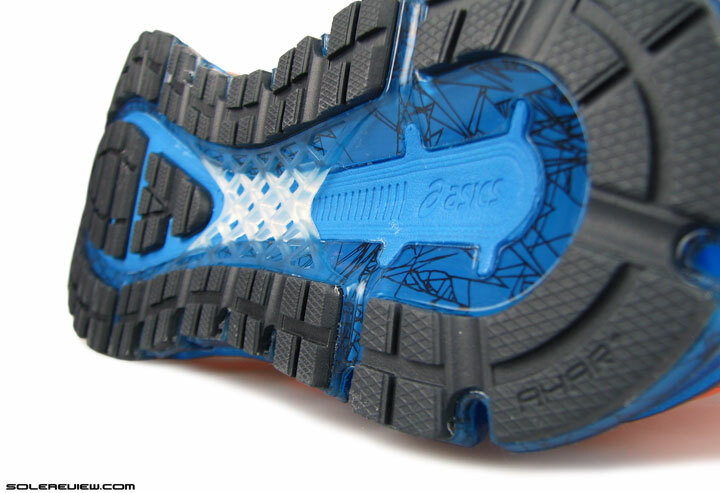 A transparent plastic plate extends from toe to heel, separating the midsole and the outsole. For a better understanding of the midsole dynamics, let’s literally dissect the underpinnings of the Quantum 360. The Gel material surrounds the near entirely of the midsole, split into exactly 22 pillared structures placed between the upper and the outsole. What’s intriguing is the way the midsole base has been designed. It is not outwardly visible, but the entire foam and Gel midsole rests on a huge TPU (hard plastic) plate which runs from heel to toe. Trusstic, as Asics likes to call it. It leaves the center of the midsole exposed, and the plate goes from thick to thin when seen from outer midsole to heel center. And right under the heel center, the thin edges of the plate slants slightly upwards. 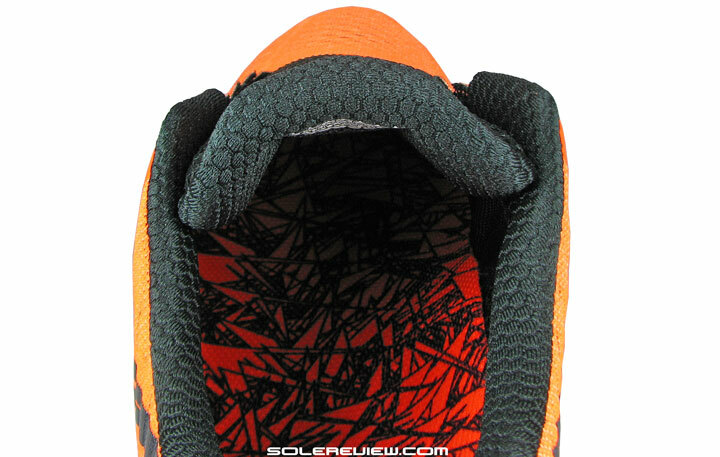 Lots of rubber on the outsole. A grid like structure spans the midfoot. A latticed bridge connects either sides of the plate under the midfoot. 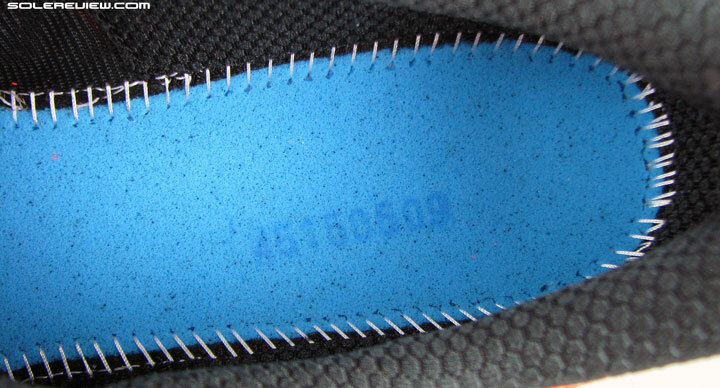 Beneath the forefoot, a couple of outsole rubber sheets are embedded on a ‘foam island’ which is part of the midsole. And what’s inside the midsole? As much as it pained us to cut through $170 of good money (we bought this shoe, as we do all others), it was very important to see what was behind those Gel pillars. The ride experience made much more sense once we understood what went into constructing the midsole. Inside, there’s foam. Lots of it, and Gel is confined to the edges. Cutting open the forefoot yields the same result. Mind you, the 360 does not have those inner Gel pieces seen on the Nimbus. It is foam, a lot of it. 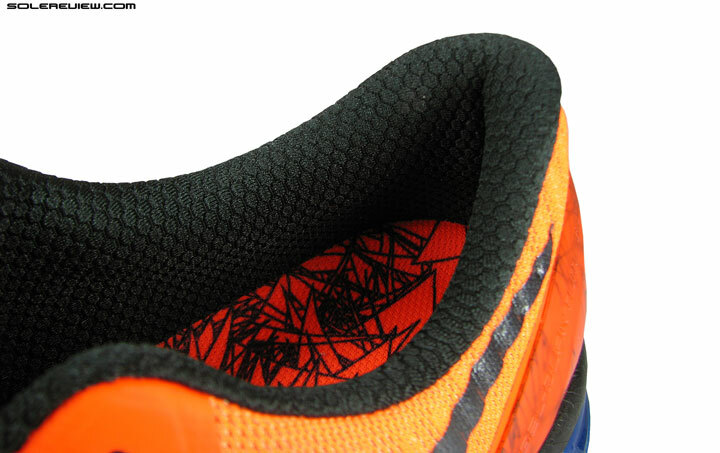 In terms of sheer volume, the cross section of the Q-360’s midsole is 85% foam, 15% Gel. Like we’ve seen on the Nimbus, the visible Gel windows stop right under the edge of the midsole, and does not extend below the foot. It must be noted that the 360 lacks the internal Gel pads seen inside the Nimbus. If this sounds familiar, then you have probably read our Nimbus 17 review. 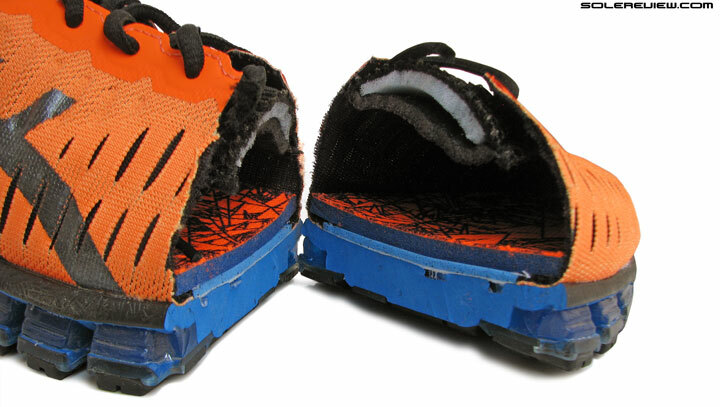 Cutting open the forefoot midsole yields the same scenery; a lot of foam with Gel being mere visual placeholders. 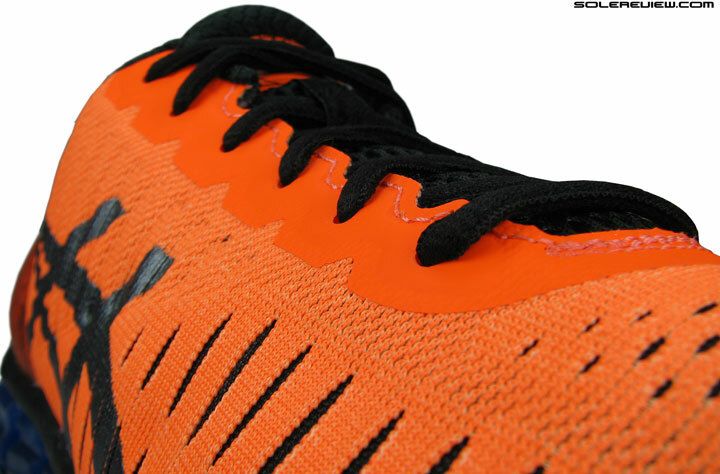 The Quantum 360’s outsole is nearly full contact. The rubber pieces are glued on the plastic plate around the edge, and under the forefoot the outsole rests on an exposed foam section. We use the phrase ‘nearly full contact’ because Asics holds back from designing a completely flat outsole, and the midfoot warps upwards. 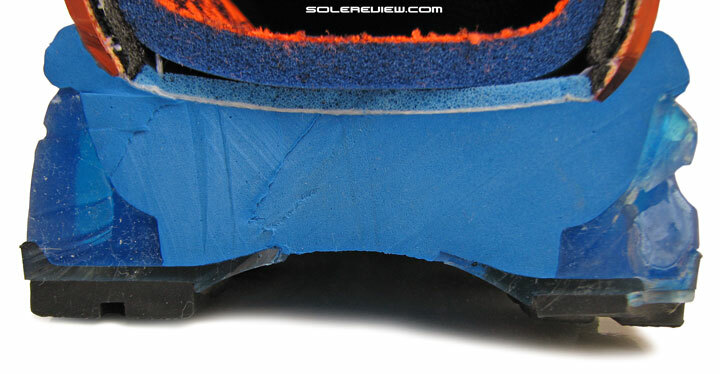 This leaves a gap below the midsole which could have otherwise been a full contact area. We have no idea why. The midsole foam is soft. The Gel pads and the TPU plate adds firmness on the sides and beneath. So running in the Quantum 360 ends up producing a mix of both. The cushioning feel is very centered, which is the the result of the foam core being softer than the Gel which cups it. If you’re a rearfoot striker, the initial foot-strike will be a mix of Gel and foam working together. 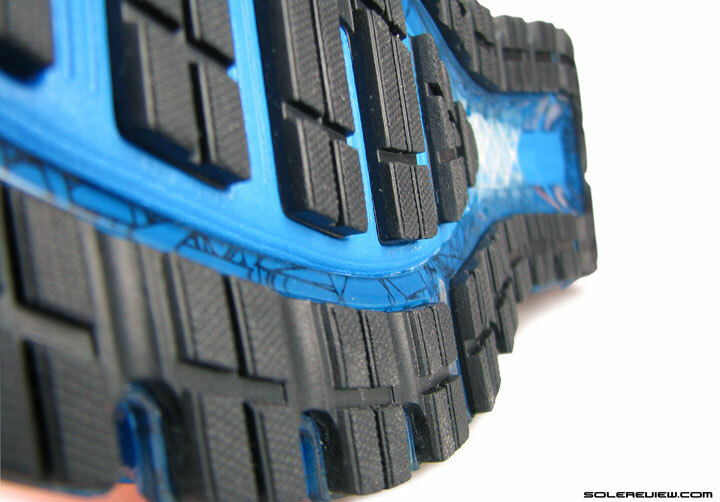 …and also due to the foam lasting below the soft insole. As you transition on the shoe after landing, the soft midsole foam, the foam lasting and the padded insole does most of the cushioning work. The removable sockliner is a 5 mm-ish thick bed of open celled foam with plenty of squish on tap. These three materials are responsible for most of the softness you’ll experience running in the Quantum 360. Which begs the question: if foam is responsible for the soft ride, what is the role of the Gel ring and the plastic Trusstic plate? Believe it or not, the Gel pads actually work as support structures instead of providing any softness. The firmer Gel units work as a support feature, and prevents the soft midsole from cambering under weight. We saw this was the case on the Nimbus 17, and the Quantum 360’s unique design keeps that truant behavior in check. As underscored earlier, the only area where you’ll actually get to experience any of the Gel cushioning is under the outer rearfoot edge. 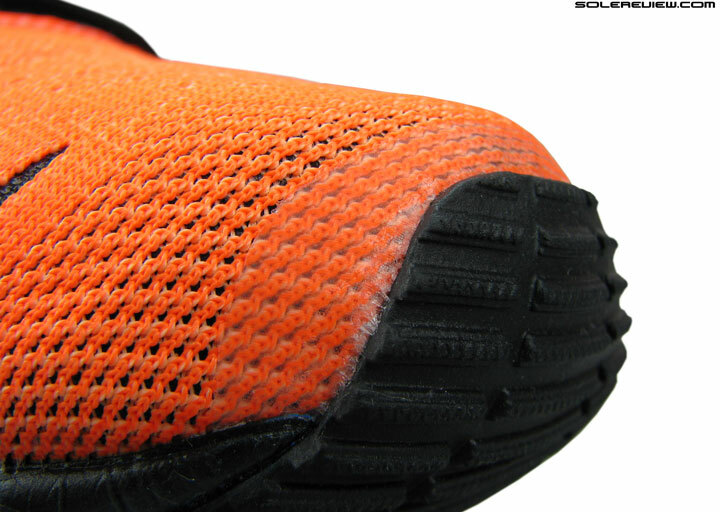 The forefoot outsole is glued on to an exposed section of soft midsole foam. The soft center can be felt in isolation during runs. 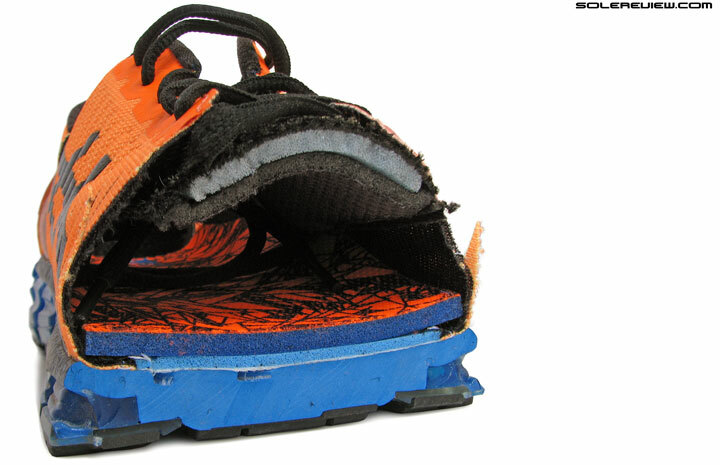 Under the forefoot, the soft foam core comes across as a cushioning unit working in isolation. The sides are reinforced with hard plastic and firm Gel pillars, so the center has more give than the edges. This sense of cushioning isn’t exactly consistent. One wishes that the plate extended under the forefoot like how it does under the heel. 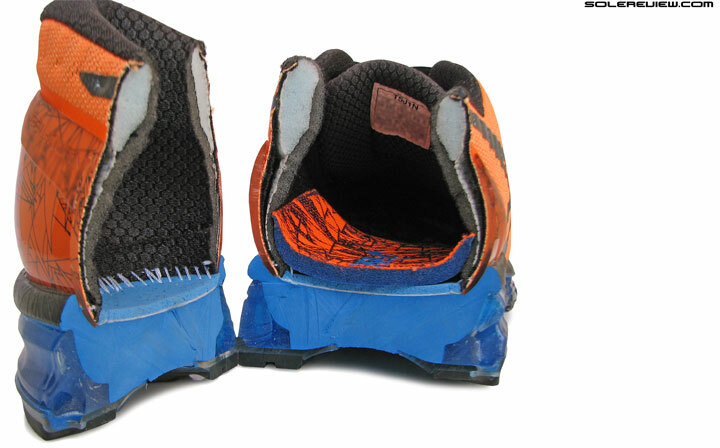 Over distance, the forefoot center starts feeling like a sink-spot in relation to the sides. It would be interesting to find out how the forefoot feels after 200 miles. If the foam center flattens out relative to the more resilient Gel side pads, you might potentially have a small crater under the ball of your foot. 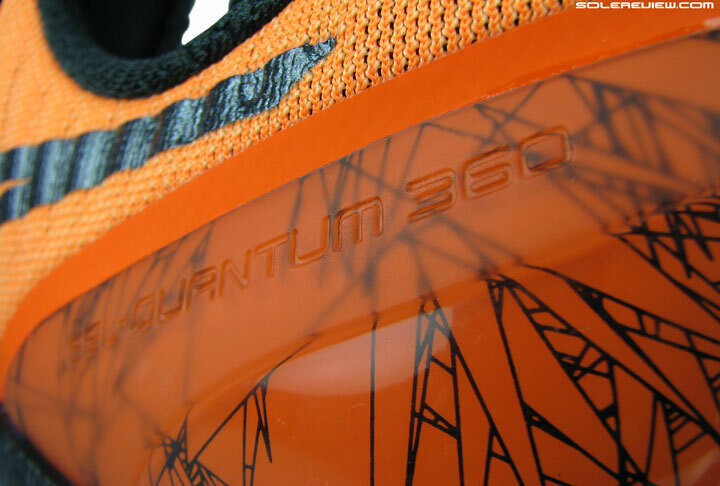 The heel plate adds something to the Quantum 360’s ride which we haven’t experienced in Asics shoes for a long time. The heel actually feels slightly responsive instead of the usual soft give of multi-layered foam. And how exactly does the shoe manage to achieve this effect? Look closely at the heel center. Notice how the plastic plate tapers and angles towards the center? When weight is applied, the tapered edges of the plate acts as a spring of sorts. Under the heel, the edges of the plastic plate taper towards the center like Cantilevers and have an upwards angle. These flat ends support the center of the heel, and when weight is applied, they tend to flex a bit, somewhat like a baby version of automotive leaf-springs. This design is clearly visible in our cross section picture above. There’s also a catch. Since the plastic plate is rather hard and resistant to flexing, the level of responsiveness increases with speed. Short, quick bursts of weight loading leads to an increased snap-back action of the heel plate, compared to a toned version of this sensation at lower running speeds. So while the Quantum 360 doesn’t live up to its name (and expectation) of delivering an immersive Asics Gel ride experience, it ends up being a supportive and responsive running shoe. We’re very curious to know how the actual Asics Gel cushioning will feel like, instead of the superficial Gel veneer of the Quantum 360. Like a huge Gel unit padding the entire rearfoot area, for example. That said, there are a few other things which the Quantum 360 could do a much better job at. Its weight is an impediment to care-free running; 400 gms is a lot more bulk than what people are used to these days. The 360 is a heavy shoe, and cushioning tech showcases usually tend to be. The Nike Air Max and Mizuno Prophecy are proof enough. The transition quality starts off well in the rearfoot, but the midfoot and forefoot doesn’t seem to add up. 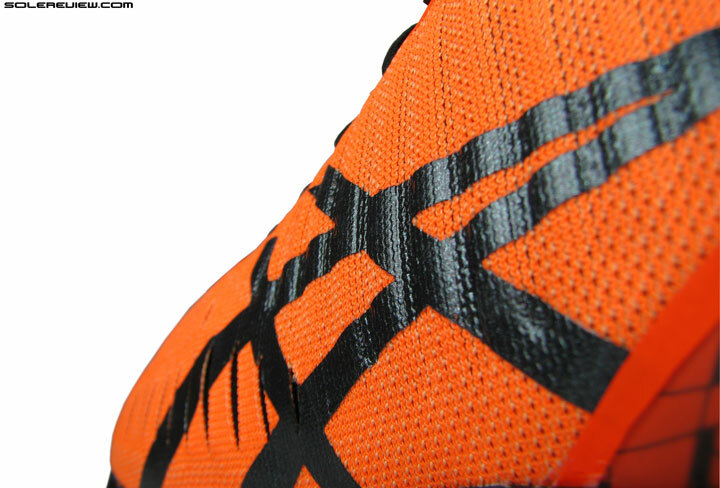 The culprits are the warped midfoot outsole design and the isolated forefoot. This is strange. 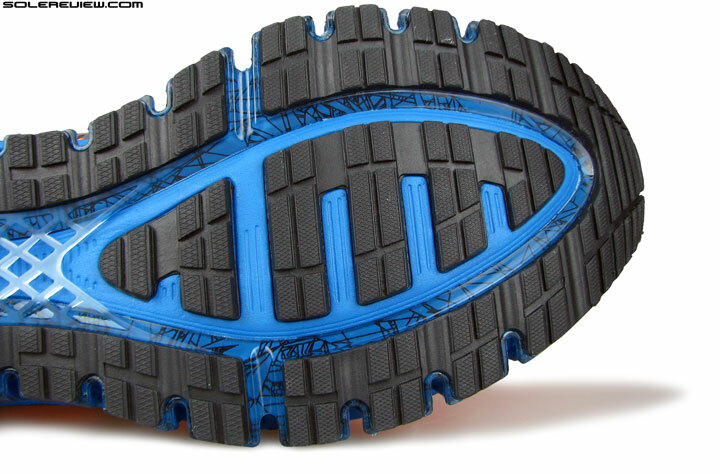 A non-full contact outsole design on a full covered rubber outsole. Yes, we’re talking about the gap underneath the midfoot. 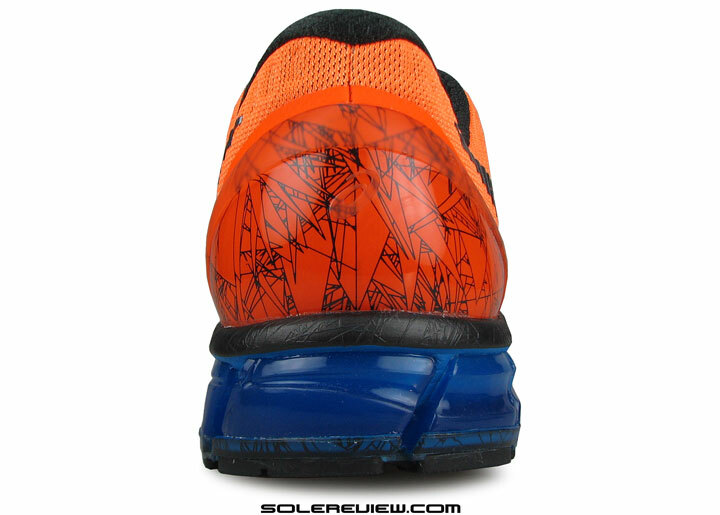 Instead of touching the ground, the outsole curves up under the midfoot, leaving a visible gap. Most brands now feature a full contact outsole, and if Asics had adopted a similar approach, the midfoot transition quality could have been far smoother instead of feeling somewhat disconnected. Transition under the forefoot could have been better too. The foam core under the forefoot feels like a transplant from a different shoe. The Q-360’s rearfoot is firm, responsive and consistent, check. The forefoot is softer with a slightly lumpy effect, so push-off’s feel like bit of an effort. Of course, the Q-360 feels more efficient than the Nimbus 17’s ultra soft ride; we’d go as far to say that 360’s forefoot ride has one-up over the Cumulus 17’s too. The Quantum 360 isn’t the Asics Gel experience one would want it to be, yet we do like the shoe’s cushioned yet supportive feel – something which has been missing lately even in their ‘stability’ shoes such as the Kayano 22. Though the Quantum’s ride doesn’t feel fast, it steers clear of the mushiness which comes with the all foam midsole territory. Till a couple of years ago, Asics was the last bastion for traditional upper design. In plain English, that entailed lots of synthetic leather layering and detailing. That is now a distant memory, and like others Asics has made the jump to engineered mesh uppers. The Nimbus 17 and Kayano 22 were good examples of that recent design evolution in practice. Those ribs running vertically over the painted logo? That be the molding detail. The toe bumper is reinforced with a transparent laminate. The Quantum 360 also features a single piece outer upper, with added details such as the large vertical slits and mesh molding. 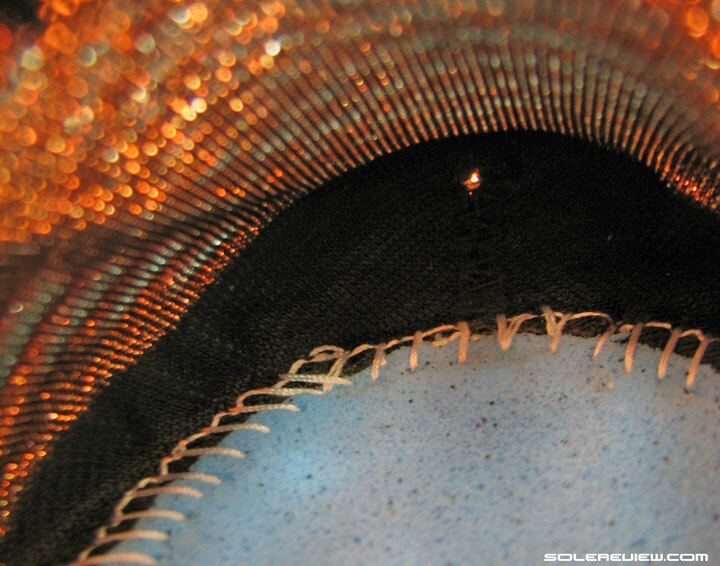 Interesting use of molding on engineered mesh – gives depth to what would have been a flat texture. Coincidentally, the Nike Zoom Vomero 11 also applies a similar treatment to its upper midfoot. 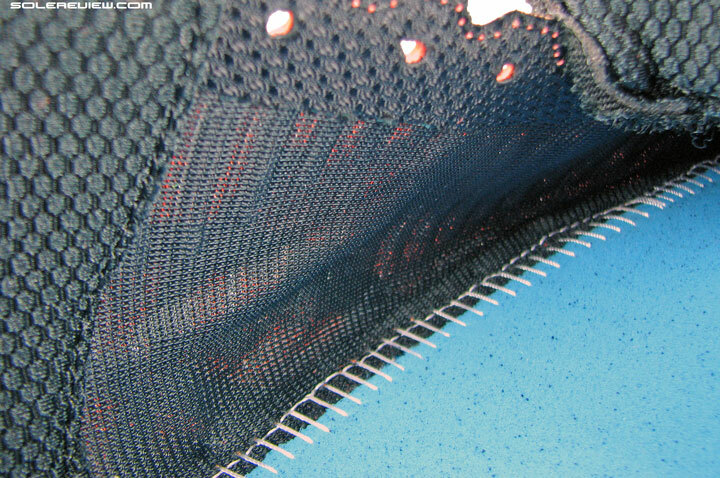 There is a second layer of fabric underneath the slit mesh which acts as a lining and smoothens the insides out. Usually, an upper design like this comes with an inner sleeve, but surprisingly Asics decides to stick to an unattached tongue design. The interiors are smooth, but why no sleeve? The tongue isn’t sewn into the upper, and stays old school style. The interiors of the Quantum 360 feel smooth, and a sleeve would have made it even more so. And of course, it would have completely eliminated tongue slide – which unfortunately, the 360 is slightly prone to. Guess it is hard to teach an old horse new tricks, as the saying goes. Either that, or there’s no Japanese word for upper inner sleeve. The plastic counter makes the heel stable and supportive. Same fabric lining as the Kayano and Nimbus. The heel has a huge external counter made of transparent plastic. The sheer size also lends to the stable feel of the Q-360’s rearfoot, working in concert with the supportive heel midsole. Rest of the upper is standard fare. The tongue and collar use materials and padding recognizable from the Nimbus and Kayano; not inadequate by any standard, but you do wish that a $170 shoe had a plusher upper. There isn’t a great deal of padding inside the tongue. The forefoot fits narrow, befitting the slim midsole the upper is fitted on. The tongue has relatively sparse padding which lets the lacing pressure through, and the heel foam padding also feels like it’s inspired by a spartan Mizuno and not a Nimbus. Reflectivity? Not even the faintest trace of it. As far as the upper fit is concerned, be well aware that the Quantum fits very narrow in the forefoot and early midfoot too. The upper space is joined at the hip with the slim midsole below, and the non-stretch inner lining prevents any stretch. …but it is very slopey inside. The toe-box is shallow as well. The upper molding on the sides extends all the way till the toe tip and doubles up as a toe-bumper of sorts, but that isn’t enough to create vertical space. Guess it is a result of the last or fit profile used to build the upper. The shoe also runs warm, and that sensation is localized under the ball of the foot. Not sure why that it is. Is the plastic plate+Gel generating heat with each flexing motion? That could be possible, for the warmness starts getting noticed only after a few miles into the run. The upper heel fits well, thanks to the over-sized heel counter and its narrow molding. So no slippage occurs despite the shoe’s high weight. So what do we ultimately think of the Quantum 360? It does have an unique ride befitting its equally unique design aesthetics. However, the caveat is that the ride’s uniqueness is based on the shoe’s ability to mix cushioning, responsiveness and support well, a quality which we haven’t experienced on an Asics in a long time. If you were expecting the Quantum 360 to deliver a 100% Gel cushioning experience, then the shoe is not it. More like 10% overall, we’d say, which is as good as running in a pair of a Kayano or the Nimbus. At least these two models have circular Gel units directly under the foot – which the Quantum 360 does not. So if you’re ready to pay $170 for a blend of responsive cushioning and support, then we can think of many other shoes which can do the same or better job for much less. All that glitters isn’t Gel. This comments thread is for the Asics Gel Quantum 360 review. Please stay on topic to make the discussion productive and helpful for others. Thanks! It would be great if Asics really used a true Gel midsole for a change. It will be heavy, but at least people will know what it feels like! I mentioned this in the comment above this one, and you said that Gel Kinsei has a ‘true Gel midsole’?!? Unless there is more than one person using the Moderator log-in? This reply was made 4 days before your original comment. But that still doesn’t make sense – either you thought that the Kinsei was solid Gel or not? Not that it matters – I’d still like to see a shoe with a 3mm pad of gel, atop a foam midsole, across the whole sole of the shoe. That would tell us how Gel really performs. The Kinsei comment was a just a question, don’t know for sure whether Asics actually makes a true Gel midsole. Yes, would be interesting to see how a shoe like that rides. I doubt that an entirely-Gel midsole would be stable (and it would be heavy), but a 3mm thick gel pad, across the entire heel, and perhaps the forefoot, wouldn’t weigh more than this shoe and should have more of an impact on feel. That’s a shoe I’d be interested in. Isn’t Kinsei a full rear-foot Gel shoe? Haven’t worn them, but they sure look like one. The old pair that I looked at, had a foam core, which spread out underneath the ‘ring’ of gel. The outsole was attached to the foam, not the gel. Got it, thanks for clearing that up. Hi Soolereview, thank you for your review and website, it is great! I have a small question I am heavy runner, arround 112kg for 6.3ft. Need to loose weight :), I am pronator and maybe run 2 times a week 5-8km. Which shoes do you advise me? Are vomero 10 or Odyssey any good for me? I have read somewhere also the adidas glide boost 8, or Asics with Gel technology was nice for heavy weight as this quantum 360 or gel cumulus17? thank’s in advance for your help. You could either get the adidas Ultra Boost ST, or the Nike Odyssey if you want something firmer!